I live in an area with a mild winter climate, but last year the weather was wacky. Some of my favorite shrubby Salvias that would normally be green and attractive all winter looked mangy by January. Their leaf tips were brown and dead. Others totally lost their foliage and had shriveled, darkened stems. Some came back last spring and others didn't. If this happens again, should I trim back the damage? Winter last year was unusually cold in what we would normally think of as warm winter areas, such as USDA Cold Hardiness Zones 8 to 10. However, the Farmers' Almanac did warn us in August 2013 to expect a "piercing cold" season. 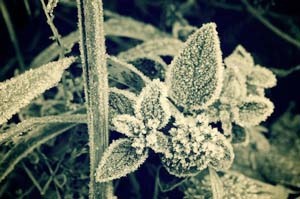 An 8-degree drop in standard winter temperatures may seem like nothing to gardeners in Zone 6 or colder areas. However, it can be damaging for warmth-loving Salvias if it places the plant outside its cold-hardiness range and if the decline lasts for days. Sometimes it's possible to know when persistent drops in temperature will arrive. Then you can winterize favorite plants in many ways, including covering them or adding thick layers of mulch to keep the ground from freezing, thawing and freezing again. If the inside is green, the stem is alive; if brown or another dull off-color, then it is safe to trim at that point. But when temperatures dip unexpectedly or ice storms and snowstorms hit, then you need to focus on the best recovery methods for sages in your garden. First, put down the snippers; no matter where you live, pruning sages before spring can be more damaging than frostbitten leaves. Dead foliage is like a scab; it protects the tender, live foliage in other parts of a plant and can insulate other parts of shrubs from further damage. The branches of some shrubs or subshrubs -- plants with soft herbaceous as well as woody growth -- may die back, wholly or in part. However, you won't know until spring whether new growth will emerge from the roots or from live parts of the branches. It's a good idea to continue watering damaged plants periodically throughout winter, selecting times when no sudden, adverse changes in weather are predicted. Watering before a freeze can result in frozen roots. The inner core of any Salvia stem is hollow. If you prune the stems during winter, you risk having them fill with water and snow that can sink down to the plant's crown causing root rot. The water can also freeze and cause stems to split as they thaw. However, if conditions are unexpectedly cold but dry, it is possible to trim a bit as long as you don't cut stems where the inner layers are alive. To determine whether and where stems are dead, gently rub the outer bark between your fingers to strip it from the inner growth. If the inside is green, the stem is alive; if brown or another dull off-color, then it is safe to trim at that point. As Britain's Royal Horticultural Society (RHS) reports, the woody stems of some shrubby perennials have ways of protecting live cells from freezing. For example, some plants accumulate sugars and amino acids that lower the freezing point of fluids in cells, similar to anti-freeze. A good, winter cleanup idea is to remove any masses of leaves that fall and snag within the branches of Salvias so the leaves won't rot and attract unwanted insects. Overall, though, it is wise to wait until spring and threat of frost has passed before pruning. Be patient, because new growth can take longer than usual to emerge from frost-damaged plants. Make note of any locations in your yard that are particularly hard hit. Consider whether plantings there might fare better in more sheltered locations, such as along a south wall. The RHS notes that some parts of the yard that we might think of as being protective, such as fences or hedges, can act as frost pockets during severe weather. When cold air reaches these obstacles and can't travel through them, it drops to the ground and creates an extra-cold spot. One solution is to create breaks at the bottom of fences and hedges through which cold air can disperse. Winter is a good time for garden planning, including making plans for replanting frost pockets with cold-tolerant Salvias. At the first hint of chill next autumn, it's a good idea to cover these areas with a warm bed of organic mulch. Remove the mulch when spring arrives. When severe weather threatens, you should also temporarily cover plants with clear plastic to insulate foliage but allow it to receive sunlight. In our Everything Salvias blog, we offer lots of Quick Digs winterization tips. If you would like suggestions about how to protect herbaceous perennials as well as shrubs, please call or email us. If you lose plants due to harsh weather, we can also help you select better replacements for the next growing season. Even in the green Eden of warm winter zones, surprising weather occurs. Snow is virtually unknown in California's San Francisco Bay Area. However, when it came fluttering down in winter 1972, it even caught wild birds by surprise and caused many to die. Phila Rogers, a longtime volunteer for the University of California Botanical Garden (UCBG) remembers how the snow melted but then turned to ice when the cold deepened. Rogers talks about that winter in an article published by UC's Lawrence Hall of Science. Rogers recalls succulent plants turning into "black mush," hedges freezing and 1,500 species at UCBG dying. The year-round Anna's hummingbirds "were found comatose," she writes, when flower nectar became unavailable. Gardeners tried to keep them going with sugar water, but the feeders kept freezing. One result? "After that punishing December," Rogers says, "the Botanical Garden planted fewer frost-sensitive plants." the recent set of 5 flowers are doing well. It is cool in the desert ... under 90. flowers purchased previously did not like temps above 90. As soon as it cooled off .... they started blooming again. I am very happy with my experience with Flowers by the Sea. Ordering was easy and the plants arrived in great shape. Thank you!